EPF members or employers who have complaints or queries regarding Employee Provident Fund Scheme such as UAN registration, PF registration, PF withdrawal, KYC linking etc… can solve their problems by registering a complaint at EPF grievance Portal. Here we will know how to fill EPF grievance registration form and how much time EPFO will take to resolve the issues. 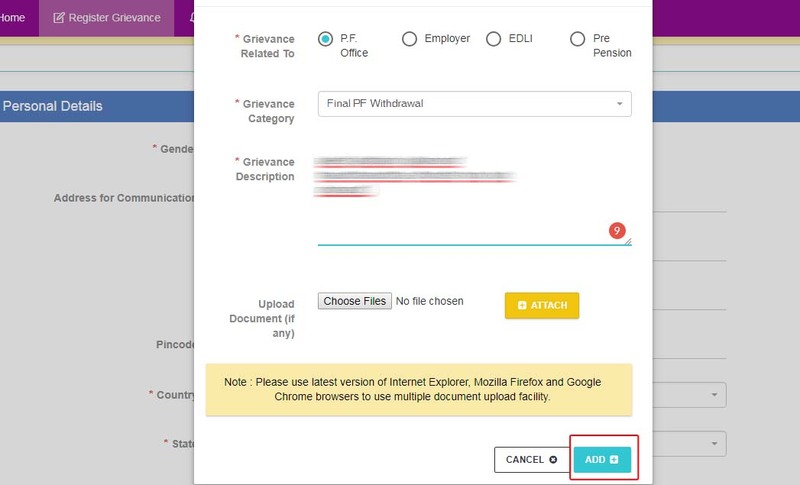 EPF grievance portal is a platform created by employee provident fund organization which allows EPF members and employers to register their complaints. The best part of registering a complaint at EPF grievance portal is, when you register a complaint here then it will reach to your regional EPF office where your complete EPF data is present. So it becomes easier for the EPF officer to solve your problem. 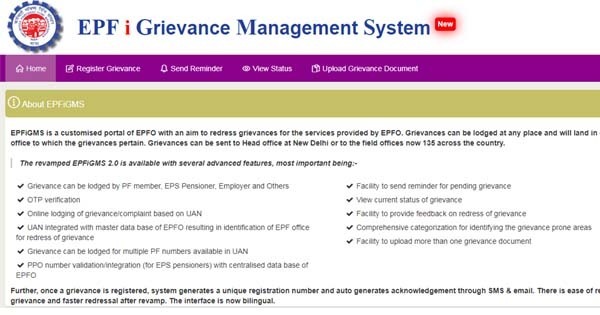 Recently EPFO introduced new EPF grievance portal with the new design, which is making registering complaints much easier. PF members and employers can register their complaints. You can send reminders to the regional EPF office regarding the complaints. Online tracking of the PF complaint status. You can upload related documents regarding your PF complaints. 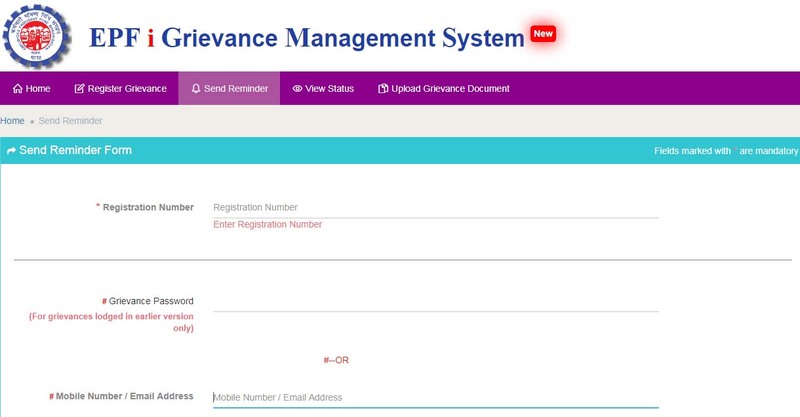 Step 1:- To register a grievance at PF portal go EPFiGMS.GOV.IN website. In home page click on Register Grievance option. Step 2:- Now select your status whether you are PF member or EPS Pensioner or Employer or Others. If you selected PF member as a status then enter your UAN number and captcha appearing on the screen and click on get details. Step 3:- Now last Three digits of your UAN number and mobile number will appear on the screen. Now click on Get OTP option. Now an OTP will be sent to your registered mobile number. Now enter that OTP and click on submit. 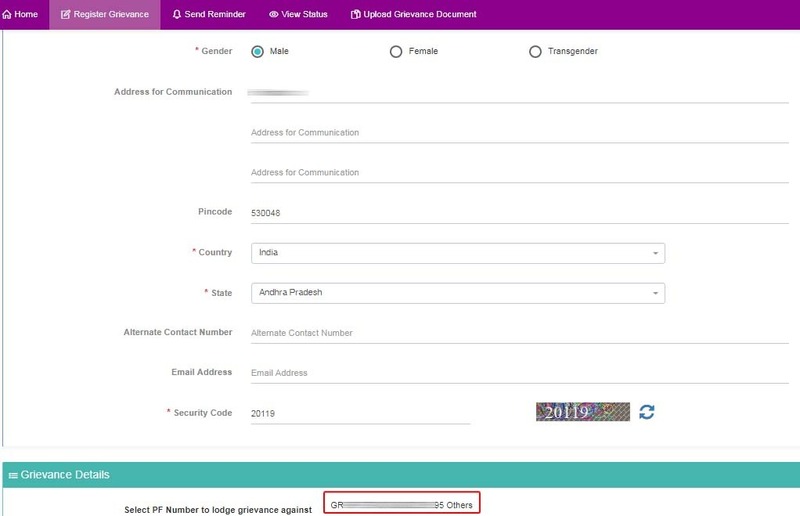 Step 4:- Now select your gender and enter your personal details like your address, alternate mobile number and email id. After entering all the details click on the PF account number for which you are raising a grievance. Step 5:- Now you need to EPF grievance registration form. Here you need to select to whom EPF grievance related and grievance category and enter the description of your grievance. If you have any supporting documents then attach those documents, finally click on Add. 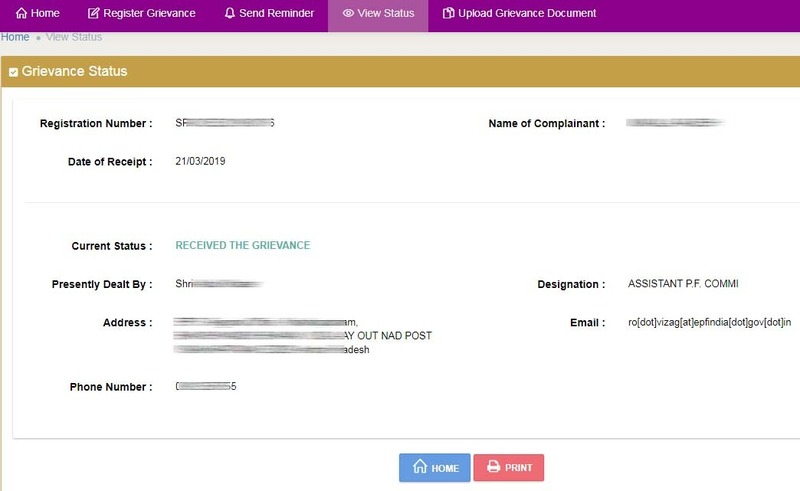 Step 6:- Now your grievance details will appear on the screen, if you want to edit your grievance details then you can edit them or you can remove them. If everything is fine then click on submit. Once you click on submit, you will get a successful registration message on your screen with the registration number i.e complaint number. The same details will be sent to your registered mobile number. Not your registration number, you can use it further to send a reminder and to track the status of your complaint. The time taken to resolve EPF complaints varies from case to case but the maximum time is 30 days. But you will get a reply to your email id from your regional EPF office within 24-48 hours (if there are no holidays). Once you receive the reply from EPF office then you can proceed further. After every successful EPF grievance registration an EPF grievance registration number will be generated, if you didn’t receive means, your complaint is not registered. In this case, try to register grievance again. If your grievance not submitting then it is problem with your web browser as I said earlier always try to register your grievance in the latest version of Google Chrome, Mozilla Firefox or Internet Explorer. EPF members who didn’t get any reply from EPFO can send a reminder. 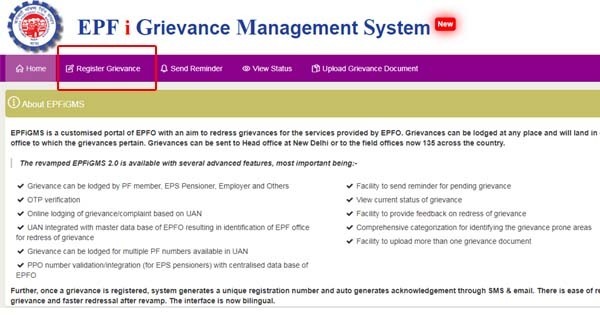 To send a reminder again go to EPF grievance portal and select Send Reminder option in the menu bar. 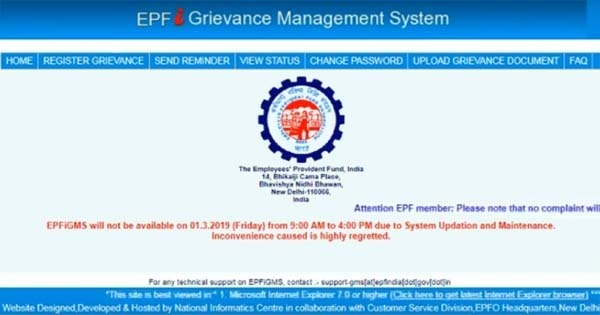 Now a new page will open, here enter your EPF grievance registration number, and there is no need to enter grievance password if you have registered your grievance in new grievance portal, just leave that field blank. Now enter your mobile number/email id and type the reminder message and finally enter the captcha and click on submit. Now a reminder will be sent to your EPF office. To track your PF complaint status again go to EPFiGMS website, and click on View Status option in the menu bar. Now a new page will open, here enter your complaint number, leave the password field blank, and enter the mobile number & captcha and finally click on submit to track your EPF complaint status. I have applied partial withdrawal ( form 31) for hospital emergency on 05 April 2019.That day to till the date system shows its under process.How I can understand the present status.When it will credit in my account. It will take maximum 30 days, even if your claim status doesn’t change after 5th May then raise a grievance at PF portal. Change your mobile number at UAN portal and they try.